Thanks to Warner Bros. for giving me early access to the film and access to the cast. The opinions I share are my own. This post contains links to Amazon. If you click on the link and make a purchase, I get a tiny commission of the sale. I had the chance to listen in on a conference call with the young stars of Max 2: White House Hero I really enjoyed this charming family film and shared my thoughts on it yesterday. Today I thought I'd share a bit about the call! Francesca Capaldi is best known for her role as Chloe James in Disney's Dog with a Blog, but she's also been the voice of the little Red-haired girl in the Peanuts movie and the face of Claire's Stores Tween line. Zane Austin is a committed young actor who has starred in various national commercials. Both Zane and Francesca were incredibly down to earth and bubbly with a lot of enthusiasm for the film. They easily fielded the various questions they received from the expected questions about working with dogs to the maybe more personal question about sharing a first kiss on screen. 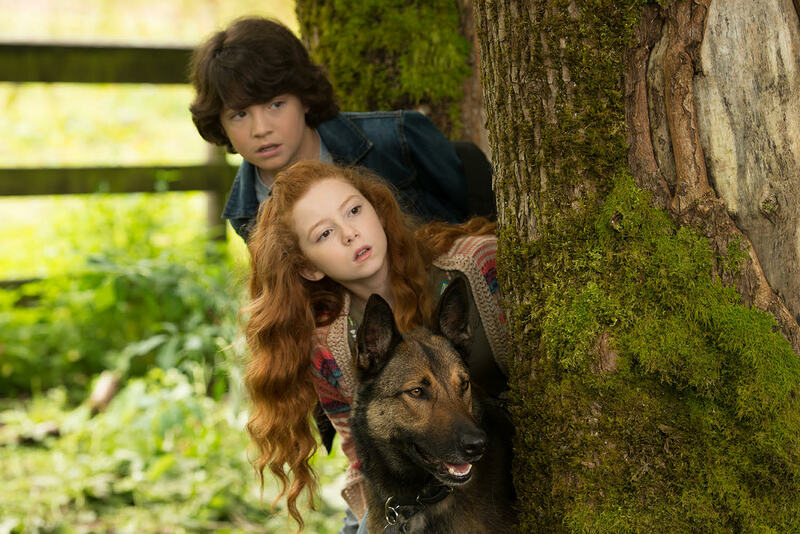 A film centered around a canine would naturally be of a lot of interest to viewers. What is it like to have to act with an animal on set? Fortunately and perhaps naturally both young actors love animals...Zane has a family pet, "Wilson" a goldendoodle and Francesca previously worked on the show Dog with a Blog giving her a depth of experience. That doesn't keep them from dreaming of more pets in their future, though, while Francesca would be thrilled to have a maltipoo she also harbors the wild dream of owning a koala. Zane already has a dog which allows him to dream even more of owning a sloth. What might be more surprising is that a film like this doesn't work with just one dog. It actually used four dogs to make every scene with Max come to life. The different dogs fulfilled different roles. Jagger was the main working dog who did most of the scenes. (he was actually recently featured in Entertainment Weekly!) Dude was the stunt dog who did things such as jumping through car windows. Carlos is the face of the movie....featured in the promotional materials and attending the film's premiere. The fourth and final dog, Pax, did the action work such as swimming and running. It's so interesting to think about the amount of work that most go into making the film feel seamless with a dog. "They are all very, very talented dogs," Francesca was quick to say but when pressed for a favorite she admitted it was probably Jagger as he is a very loving dog who likes to give kisses. Zane agreed that Jagger was his favorite. Working with the dogs also required a period of time with the trainers where the dogs got familiar with them and the sound of their voices. Learning a Russian accent and doing the various action sequences in the movie presented both a challenge but also fun. Francesca has done some accents before but maintaining the accent through the movie was a fresh challenge for her. I have to say she did a great job! When asked about the kiss the two characters shared, Zane commented that they had to film the kiss 30 times. Francesca admitted she was nervous about the kiss scene, but her mother reassured her that it's not her first REAL kiss but her first REEL kiss. With so many cameras and people around, it was hardly real. It might be concerning to some that such young kids are already doing acting. However, it seems that both Francesca and Zane are well grounded. They attend school and participate in extra-curricular activities. Acting is just an extra lucky thing they get to do. Max 2: White House Hero is available on digital demand right now with the Blu-Ray coming May 23rd.